I am all about the blanket scarf this season. They were very popular last season as well and I am so happy to see that the trend has not yet faded. I love layering a poncho or blanket scarf with a cute rounded hat, dark denim jeans with a pair of chocolate brown booties. I love that you can dress in comfort and still look trendy. This look includes, a poncho from Loft, hat from Nordstrom and my heels are from Steve Madden. 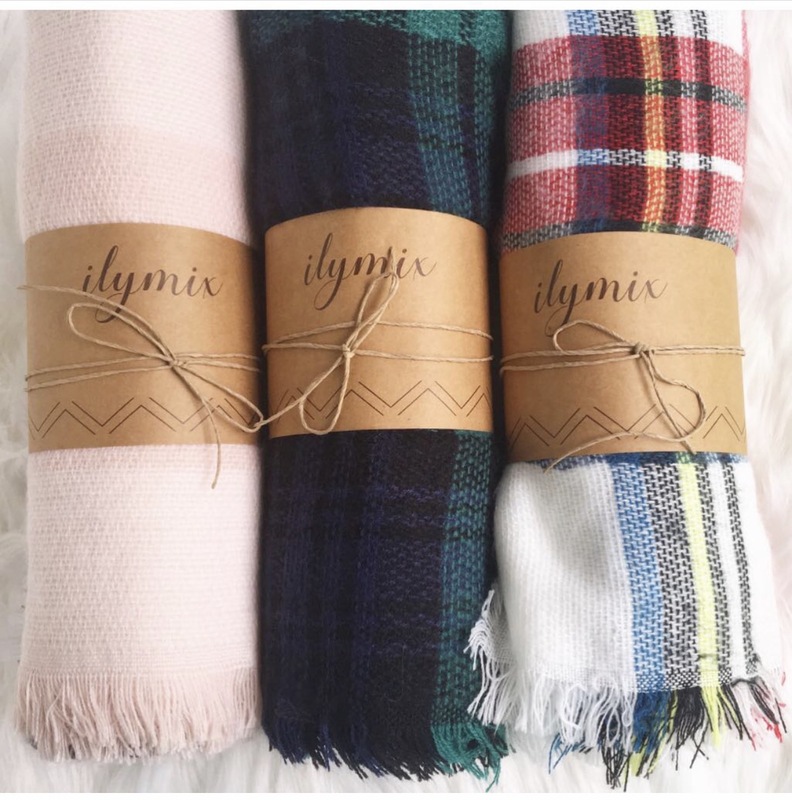 Just in time for blanket scarf season, I am excited to recently have the opportunity to pair with ILYmix and offer you my ultimate discount code yourdarlingstyle20 for 20% off your entire purchase. Just in time for the holiday season! They make adorable gifts for your favorite darling gals. I am excited to venture into fall, frolicking through the wind in my favorite patterned scarf. Make sure you get yours soon, before they run out of your favorite pattern. So hurry to www.ILYmix.com and use my code for the cutest blanket scarves of the season! Today’s heat wave was refreshing, while strolling through, the ever so delightful, Central Park on this incredible Indian summer day. Although it was not as cool as preferred on a normal fall day, there is nothing like autumn in New York. 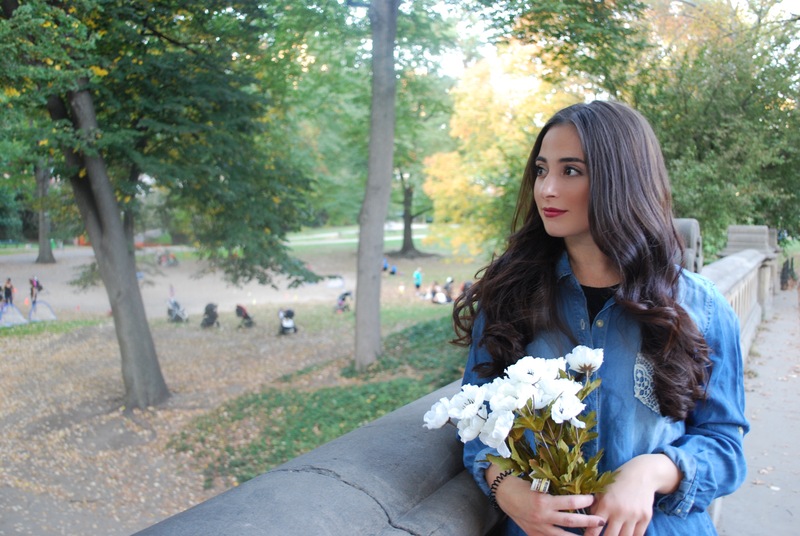 I spent this beautiful day strolling in Central Park, watching the varied colored, crisp leaves fall from the trees. 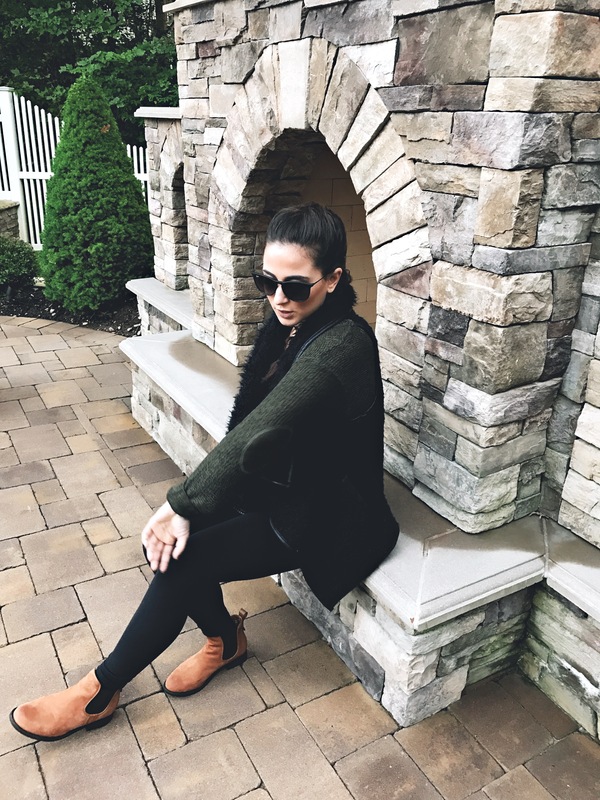 I adore fall fashion during this time of year and appreciate the beauty of the fashion, as well as the nature surrounding us, during this breathtaking season. I’ve been on the search for a long trench-like suede jacket and scored an affordable one at H&M on Long Island. I just love that the jacket has two pockets big enough to store my iPhone Plus, when on the go. 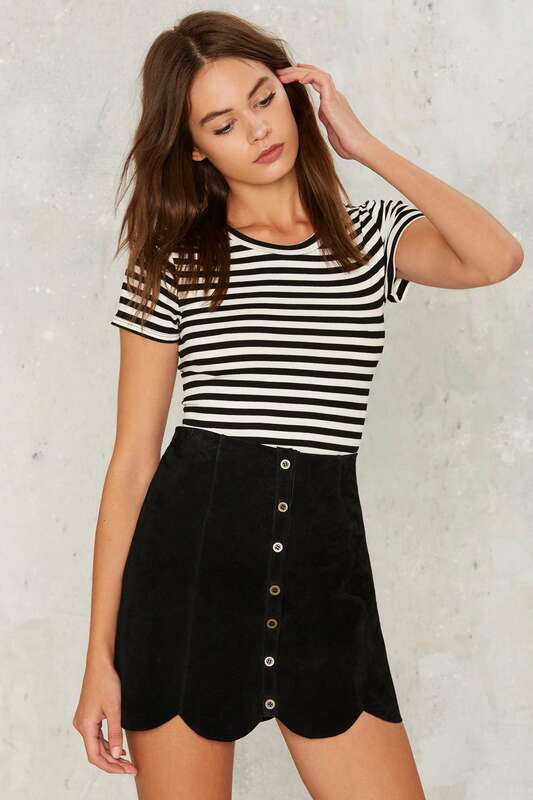 I was also was on the mission for a neutral colored button up mini skirt, you can find quite a selection at Forever 21, as well as Urban Outfitters. Since I layered today’s look, I was able to take my jacket off when I was too warm, and throw it back on when headed out on the town for the evening, as the weather cooled. Several readers have been asking about my glasses and these are by far my favorite pair I own. I’ve owned many designer shades, but Ray Ban is my ultimate “go to” pair of sunglasses. These are called the Erica sunglasses, in matte black. 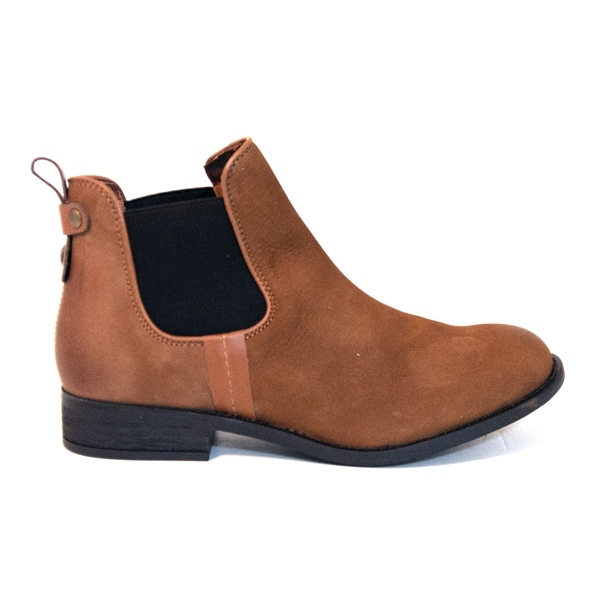 I scored a pair at Bloomingdales and now I just need to add the deep brown to my collection, also a quite attractive color. Enjoy the weather changes and take a stroll through Central Park on your lunch break or on your way home from your audition, work or class; trust me you will not be disappointed. With all that is going on in the world, take just a moment to take in the beauty of the city, breathe in the crisp fresh air and appreciate the stunning exquisite foliage of the season. Smile at the loveliness of this beautiful unique place, we call home. 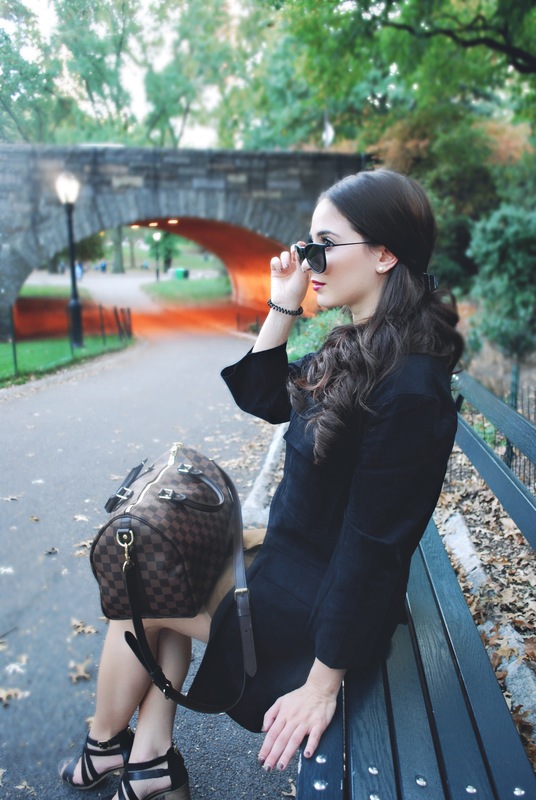 And if you’re not from New York, you must take the time to visit and stroll through Central Park, it’s worth the trip, especially during the autumn season! Mid-october is absolutely beautiful here on the east coast of Long Island. 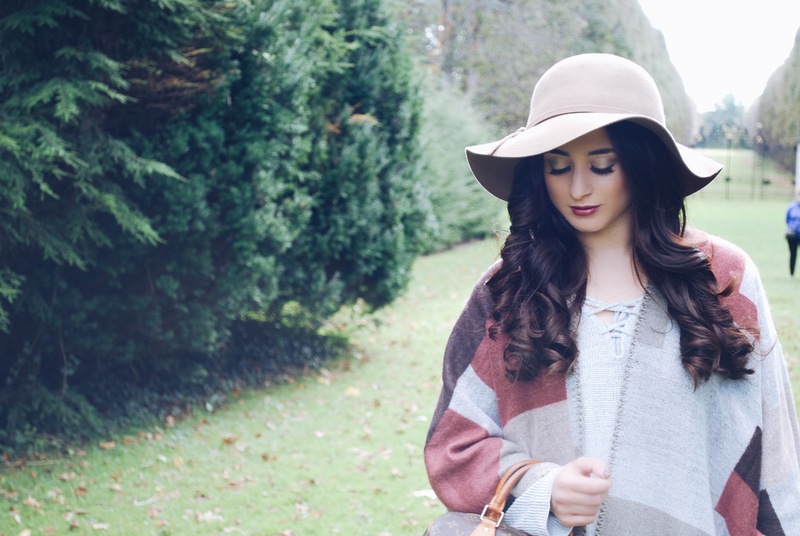 As the leaves begin to change color, so does our everyday style. We start to add more layers to our everyday outfit, digging up our favorite plaid blanket scarves and our ankle boots for cuteness. I love the transition into darker colors, like deep forest greens, burgundies, blacks and chestnut browns. is from a small boutique, Vanilla Sky in Woodbury, N.Y. 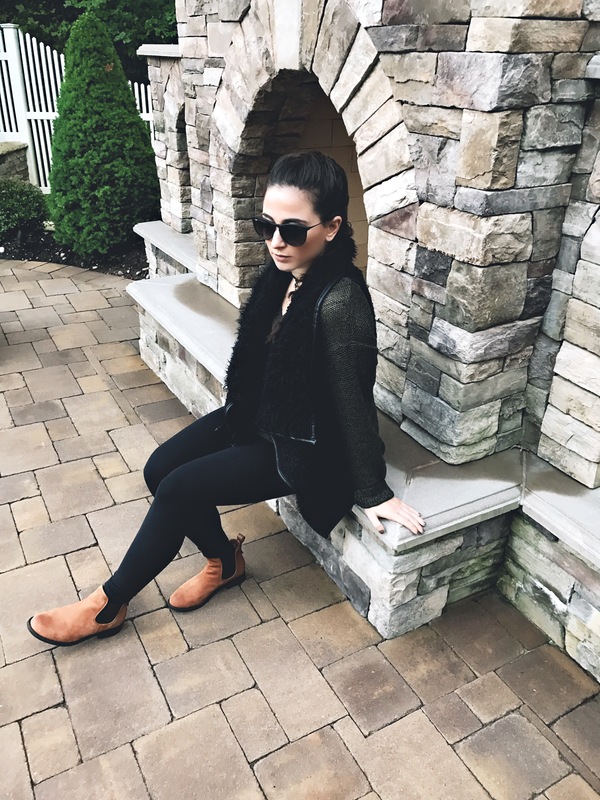 They carry an abundance of adorable trendy layering pieces and different things, which you cannot find in a typical department store.This is my go- to boutique for trendy, affordable fashion on Long Island. As for a basic black legging, I personally love my Lululemon Wunder Under III black pants. The thing that I love about this company, is the complimentary hemming for short gals like myself. My sweater is a deep green with a brown elbow patch from Francesca’s Collections. 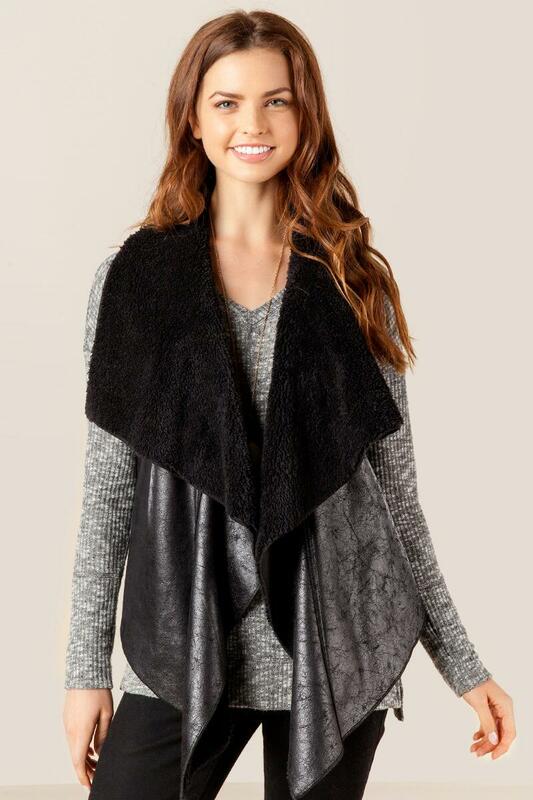 They have adorable sweaters and jewelry for all seasons. 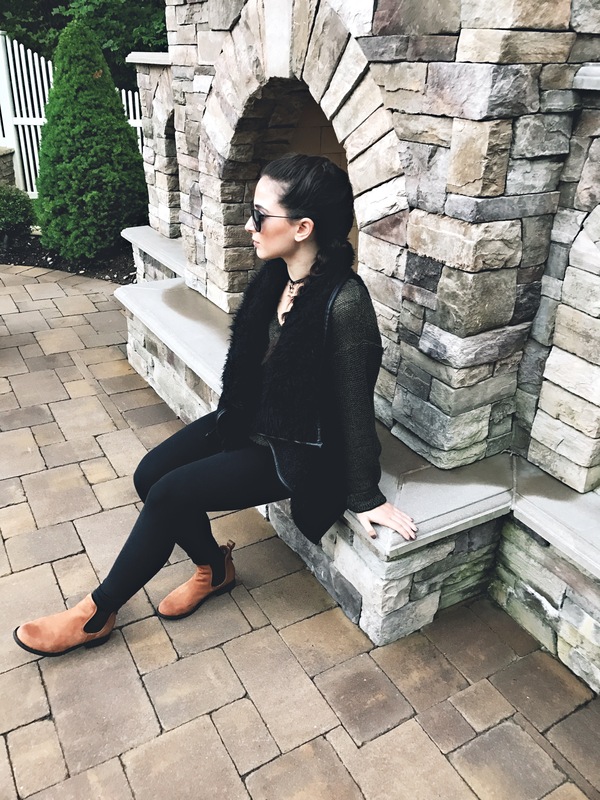 Francesca’s tends to have a buy one get one 50% off sale almost every week and you can mix and match clothing, jewelry and shoes. Happy Sweater Weather. 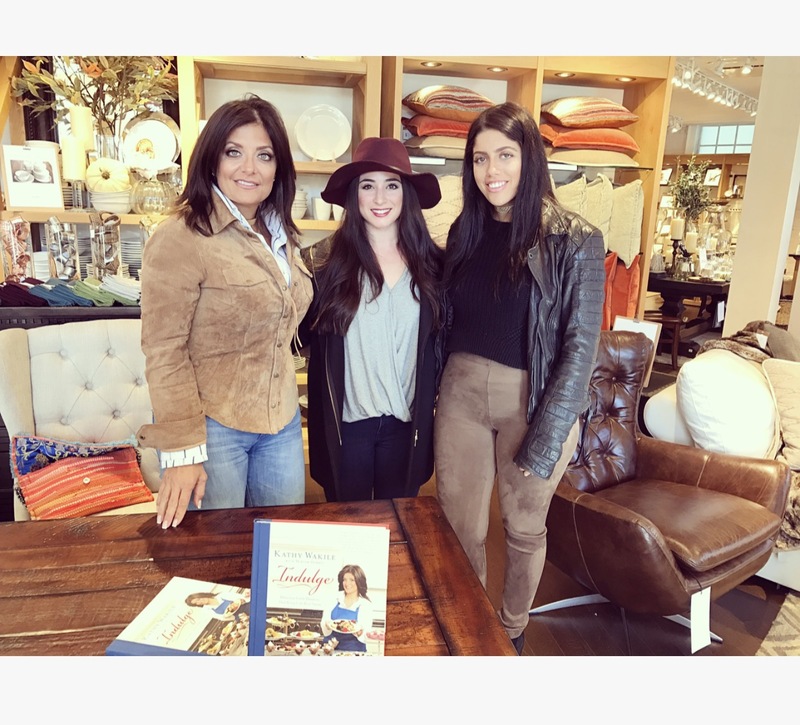 I had the pleasure of meeting the lovely Kathy Wakile at her book signing at the Pottery Barn in Southampton, N.Y. She introduced her new book, Indulge which includes many sweet recipes for baked goods and treats. She was so sweet and we had a lovely conversation regarding my mothers baking (I will do a post on her amazing holiday treats.) I was able to meet Victoria as well; which is her daughter. They are so down-to-earth and very family-oriented. I am looking forward to trying some of Kathy’s tasty treats. Definitely pick up a copy of her bestselling cookbook, you will NOT be disappointed. I was looking for the perfect book to get different recipes to try during the holiday season. Before we know it we will be baking holiday cookies and decorating the tree. But first TURKEY!! !